Nitro vs. Cask Beer: How Are They Different & What Influences Taste? Nitro vs Cask Beer: How Are They Different? By Matt Canter, Certified Cicerone® and member of the Anchor Marketing team. As educated craft beer enthusiasts (you wouldn’t think we would spend all day here at Anchor without completely geeking out learning as much as we can about craft beer, now would you?) we’re fortunate to find ourselves in close proximity to a plentiful selection craft beer bars that offer virtually endless options for local, national, and regional brews. With today’s diverse and extensive array of craft beer styles, it can be difficult for anyone, regardless how much knowledge and experience one has, to decide on just one beer in a taproom with as many as 50 (or more) beers on draught. Recently in our own taproom, a guest on our brewery tour asked about the difference between beers served on nitro and beers served from casks, which is an interesting question, so I thought it would be worth looking into a bit. Say you were served a chocolate porter from a cask and ordered the same chocolate porter dispensed from a nitro handle. You would pick up some similar flavors, aromas, and visual cues. The texture of both would be smooth and creamy – perhaps even more so than you would expect. When a beer poured through a standard CO2 tap system is compared to the same beer served on a nitrogen system, you’ll have a much different sensory experience. The same thing can be said for nitro vs cask beers: aroma, flavor, mouthfeel, bitterness, and maltiness all shift. It’s a fun experiment. Give it a try next time you’re at a bar and see a nitro and a cask option for the same beer. Cask beer is the more delicate of the two. 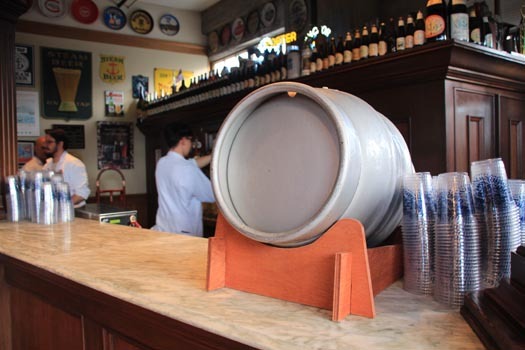 A beer served from a cask is typically unfiltered and is carbonated from the same vessel it’s served from: the cask. That means that as soon as your local pub taps a cask, it’s really only good for about 48 hours because one of beer’s mortal enemies – oxygen – interacts with the beer right away and starts to affect the flavor. Cask beer can sometimes be perceived as “flat” due to the lack of CO2 in the process. The beer is extracted into your glass through a hand pump that pushes the beer out. The warmer serving temperature (about 55 degrees, compared to the standard 45 degrees) allows all of the flavor nuances to emerge and permits appreciation of the unfiltered texture. A cask of Old Foghorn Barleywine in the Anchor taproom at our annual Christmas Ale party in 2014. Since cask beer is more delicate and difficult to deal with, it’s usually a local thing. You’ll see casks at local pubs, Irish bars, British bars, or craft bars that have the necessary hand pump, but since the beer is “alive” (unfiltered and has live yeast in the cask), it doesn’t travel well, so you’d be unlikely to find cask beer in Houston from a brewer in Portland. Nitrogen-dispensed beer, on the other hand, is more stable since the beer is processed, filtered, and handled just like any other beer you’d see at your local bar. The difference is that when it comes to serving it you, the bar uses a special tap system with a blend of 70% Nitrogen and 30% CO2 to push the beer from the keg, versus the standard 70% CO2 and 30% Nitrogen that is typically used. As a result, any beer style – hoppy IPA or rich chocolate stout – can be served on nitro, which completely transforms how you enjoy that beer. Nitrogen-dispensed beers give you a creamy mouthfeel, a smoother quality, and push the hoppy flavors down, which allows the maltiness to rise to the top of the flavor profile. If you see a beer on nitro at your local taproom, it can be fun to taste the same beer on a standard CO2 tap to do a side-by-side tasting. The differences will likely be significant, no matter your level of beer nerdiness. Nitro beers are served at a colder temperature than cask beer, usually between 44 and 52 degrees, depending on a given establishment’s nitro setup. Sometimes a beer will be served slightly warmer, but not near the 55 degrees you would expect from a cask. Finally, beers intended to be served on nitro can be shipped much more safely than casks, so you can find beers from regional and national brewers in your hometown that are served on nitro. The next question from our mystery tour guest was, “Does Anchor do any beers on nitro or cask?” Yes and no. For fun around the brewery, our team of brewers does experiment every so often with adding additional ingredients to an Anchor brew while putting it into a cask. We’ve tested Anchor Porter with local chocolate, as well as local coffee. We’ve done Liberty Ale with fruit added. The cask of Old Foghorn Barleywine seen above had a selection of spices added. It’s not a commercial effort, but something to keep our team innovating and our employees guessing as to what they can come up with. 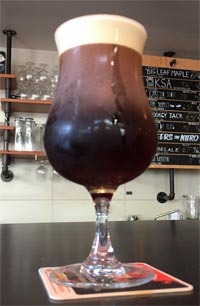 For nitro beers, the number of available nitro-specific handles in bars tends to be quite small and can often be spoken for by larger outfits that specialize is nitro beers, or have a history of making nitro beers for commercial use. Every so often a bar will – accidentally or on purpose – put an Anchor brew on a nitro handle. Those lucky bar patrons get to experience the fun difference, but it’s not an endeavor we actively seek out… at least for now.